Argan, Rick. “Bon Mot feat. Rita Banerjee.” Goddard Community College Radio. 91.1 / 97.1 FM Vermont. November 11, 2018. Sykeny, Angie. “Echo Speaks: Rita Banerjee Presents Debut Poetry Collection.” The Hippo. Manchester, NH: March 22, 2018. Morse, Jody T. “Behind the Story: Author & Scholar Rita Banerjee on ‘A Night with Kali. '” Spider Road Press. December 1, 2016. Reidy, Jessica. “Writing through Holiday Stress.” Quail Bell Magazine. November 19, 2014. Woolfitt, William Kelley. “Rita Banerjee: A Night with Kali Interview.” Speaking of Marvels. June 23, 2014. Reidy, Jessica. “Retreat, Ritual, and a Chat with the Women of the Cambridge Writers’ Workshop.” Quail Bell Magazine. May 16, 2014. Ben-Oni, Rosebud. “Community as Cathartic: A Conversation with Rita Banerjee & Diana Norma Szokolyai.” HER KIND: A Literary Community Powererd by VIDA: Women in Literary Arts. May 11, 2013.
de Soyza, Kushlani. “Rita Banerjee: Cracklers at Night.” APA Compass. KBOO Radio. Portland, OR: May 6, 2011. Xia, Maria. “Do the Write Thing: When Creative Writing Meets the World of Harvard Academics.” Harvard Crimson. Cambridge, MA: April 15, 2009. Zeltser, Yana. “Objet d’Art Arrives.” Newsletter of the Friends of Rutgers English. New Brunswick, NJ: Fall-Winter 2003. Literary North. “Seth Wade, CA Conrad, and Rita Banerjee (Ruth Stone Foundation Reading Series).” Literary North. Online. April 14, 2019. Moes, Dena. “How to Write about a Marriage Crisis and Keep the Marriage.” Books by Women. Online. April 2, 2019. Bem, Greg. “CREDO: An Anthology of Manifestos and Sourcebook for Creative Writing.” Rain Taxi. Online. March 2019. Higgins, Tamara. “Vermont’s Poetry Community.” Sun Dog Poetry Center. Online. March 29, 2019. Kwan, Katrina. “16 Top Publishers of Autobiographies.” Writing Tips Oasis. Online. January 16, 2019. Moes, Dena. “What Early Readers Have to Say.” Dena Moes: Sort of a Blog. Online. December 12, 2018. Finch, Cameron. “Fiction Writing Prompt: Take a Walk.” Online. December 6, 2018. Rau, Christina M. “2 Contemporary Books to Get You Writing.” Book Riot. Online. October 27, 2018. Jansen van Rensburg, Paulina. “Echo in Four Beats by Rita Banerjee.” 3 Quarks Daily. Online. October 20, 2018. Finch, Cameron. “School in Book Form.” Online. October 19, 2018. Desai, Aditya. “Dread, Fear, and Joy in Visual Beauty: A Conversation with Chaya Bhuvaneswar.” Split Lip Magazine. Online. October 2018. Rusch, Jason Phoebe. “An Interview with Chaya Bhuvaneswar.” Hobart. Online. September 27, 2018. Jansen van Rensburg, Paulina. “Echo in Four Beats by Rita Banerjee.” The Quarterly Conversation. Online. September 17, 2018. WORD. “WORD Presents: Readings from the Cambridge Writers Workshop.” WORD Bookstore. Brooklyn, NY: September 15, 2018. Literary North. “Rita Banerjee, Erin Stalcup, Lizzy Fox.” Literary North. Online. September 14, 2018. Loo, Kenderick. 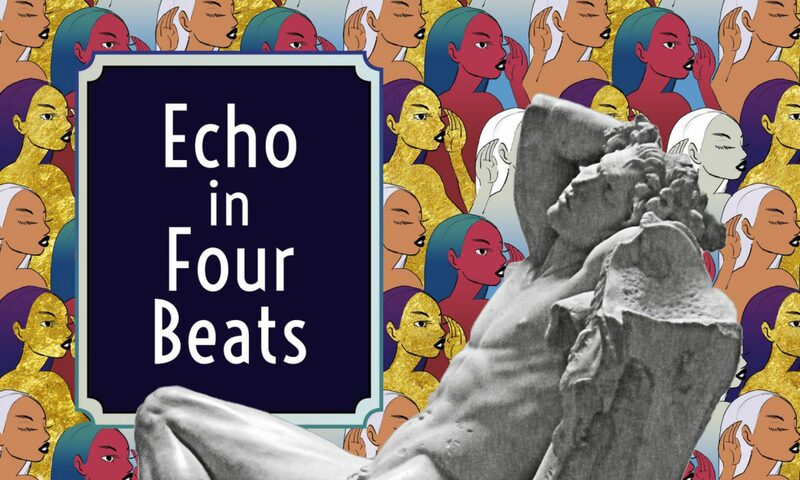 “Metered Orange: Review of Rita Banerjee’s Echo in Four Beats.” Singapore Unbound. Online. September 3, 2018. Munich Mag. “Poetry Reading: Rita Banerjee.” Munich Mag. Online. June 2, 2018. Coldiron, Katharine. “Book Review: CREDO.” CRAFT. Online. May 22, 2018. Harvard Square. “The Grolier Poetry Festival.” Harvard Square. May 16, 2018. Clark, Jim. “The Grolier Poetry Festival.” The Somerville Times. Online. May 16, 2018. NBC. “The Grolier Poetry Festival.” WAND TV 17, NBC. May 15, 2018. CBS. “The Grolier Poetry Festival Brings Poetry, Music, Dance, and Dramatic Performances to the Street.” CBS 8. May 15, 2018. Rau, Christina M. “Must-Read Poetic Voices from Split This Rock 2018.” Book Riot. Online. May 6, 2018. Bem, Greg. “Yellow Rabbits Review #43: Echo in Four Beats by Rita Banerjee.” Yellow Rabbits. Online. May 6, 2018. Curry College. “Dr. Lindsay Illich and Dr. Kara Provost Contribute to Writing Anthology.” Curry College. Online. May 6, 2016. Holder, Doug. “From Bloc 11 Cafe: Francine LaChance and the Grolier Poetry Festival.” Podcast. Online. May 2, 2018. Myers, PZ, and Ed Brayton. “Speculative Poets in Conversation: Christina M. Rau.” Free Thought Blogs. Online. May 2, 2018. LaChance, Francine. Grolier Poetry Festival: A 90th Year Anniversary Celebration.” Grolier Poetry Book Shop. Online. May 1, 2018. SPD. “New Nonfiction.” Small Press Distribution. Online. May 1, 2018. Miranda, Deborah A. “Split This Rock! 2018: Three Days in a Poet’s (almost) Utopia.” Bad NDNS. Online. April 24, 2018. Shearer, Emily. “Tongues Circling Stories: A Book Review of ‘Echo in Four Beats’ by Rita Banerjee”. Minerva Rising. Online. April 5, 2018. Cawood, Shuly. “All My Heroes Are Broke.” Online. April 6, 2018. Grunow, Melissa. “Rita Banerjee’s Echo in Four Beats.” The Coil. Online. March 27, 2018. Szilágy, Anca. “Notes from #AWP18, Part 2.” Anca Szilágy. Online. March 18, 2019. North Carolina Writers’ Network. “When Books are a Lifestyle Choice: C&R Press.” White Cross School. Online. February 28, 2018. Stilling, Robert. “Featured Review: Mad Heart Be Brave: Essays on the Poetry of Agha Shahid Ali, ed. Kazim Ali.” ASAP Journal. Online. September 14, 2017. Howard, Jennifer. “World of Books: Ready to Write Your Own Best-seller?” The Independent. London, U.K.: June 17, 2017. Howard, Jennifer. “When You’re Ready to Move from Summer Reading to Summer Writing.” The Washington Post. Washington D.C.: June 9, 2017. Miller, Kathleen Volk, et. al. “Episode 27: Suicides and Skeleton Jazz.” Painted Bride Quarterly’s Slushpile. Philadelphia, PA: February 9, 2017. Larimer, Kevin and Melissa Faliveno. “Ampersand: Episode 11.” Poets & Writers Ampersand Podcast. New York, NY: December 14, 2016. Sen Sarma, Moushumi. “There is no end to the story.” The Minimalist Indian. Munich, Germany: May 30, 2016. Loving, Denton. “Interview with William Kelley Woolfitt.” Delphi Quarterly. Winter/Spring 2016. Gibert, Tiffany. “Booze and Books: Your Lit Crawl NYC Schedule.” Time Out New York. September 11, 2014. Schofield, James. “Chapter 30 – Discoveries and Chapter 31 – Evidence.” JRT Schofield. October 24, 2014. Linocat, Debbie. “Linocat Loves Chapbooks: A List.” Linocat. San Francisco, CA: 2013.